We’re trying to make more of an effort at breakfast time. This dish by Gill Meller of River Cottage is more suited to a weekend when you have a bit more time but it’s worth it as the flavours are great. The vegetable shop can get a bit boring at this time of year but then arrives Purple Sprouting Broccoli to keep us in good spirits. Serve this with some toasted brown bread for mopping up the hot, smoky butter. Start by poaching the eggs and keeping them warm. Bring a large pan of salted water to the boil and simmer the purple sprouting broccoli for a few minutes until tender. Drain and allow to steam dry. Meanwhile, melt the butter in a small pan until sizzling then add the garlic, rosemary and smoked paprika. Cook for about a minute or until the garlic is softened but not browned, then remove from the heat. Divide the yoghurt between two warmed bowls. Lay the broccoli in the bowls with the poached eggs. Season everything with salt and pepper and spoon over the smoky butter. Serve immediately with plenty of toast. We made this for a Saturday breakfast and really enjoyed the playful balance of flavours. The pancakes are light, fluffy and not too sweet. Cook the bacon or pancetta under a hot grill, on a tray lined with foil, until crispy and keep warm. Mix the flour, baking powder, sugar and a pinch of salt together in a large bowl. Make a well in the centre and add the mashed banana, eggs, butter and milk. Whisk until you have a smooth batter without any floury lumps. Heat a little butter in a large frying pan until sizzling. Ladle in small dollops of batter and put a few slices of banana on the surface of each pancake. Cook for 2 minutes over a medium heat and turn when bubbles appear on the surface of the batter. Cook for 1 more minute on the other side or until puffed up and golden brown. Keep warm while you use the rest of the batter. 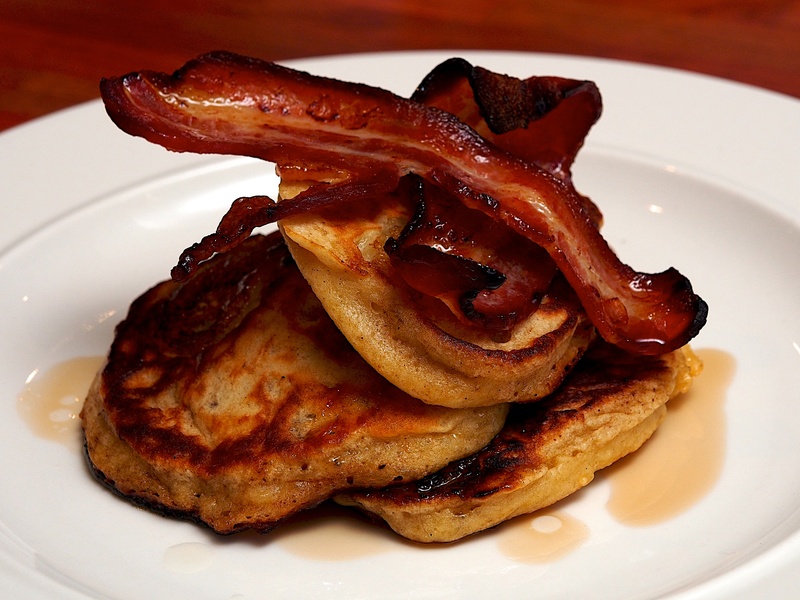 Serve the pancakes topped with the crispy bacon and a generous drizzle of maple syrup. This was no effort at all to whip up on a Saturday for brunch. We were a bit concerned when we saw the quantity of peppercorns, but they work superbly and give much less heat than expected. Scoop out the dough from the slices of baguette to make room for the filling. Pour olive oil over each slice and rub with the garlic clove. Put the slices on a tray and toast under a grill on both sides. Meanwhile, melt the butter in a frying pan and whisk the eggs. Add the cracked peppercorns and tip the mixture into the pan. Tumble and push the eggs around the pan with a flat wooden spatula (think half scramble, half omelette). Remove when still soft as they will continue to cook, and season with a little salt. 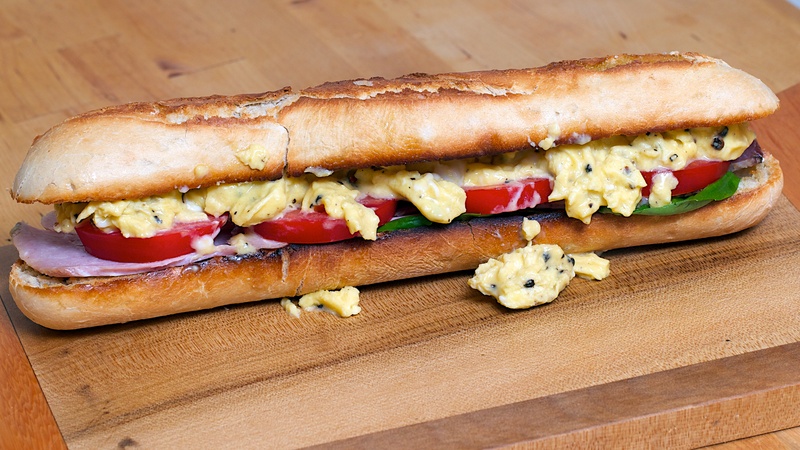 Put a few basil leaves on the base of 4 baguette slices, then add the ham, the tomato and finally the egg, finishing with the top pieces of baguette. We could get depressed in Ireland with the rain, cold wind and dark evenings but we don’t cause we’ve got mushrooms! Woohoo! Feel free to substitute a hen’s egg or omit the egg altogether if you prefer. First soak the dried porcini in 200ml of water for 30 minutes. Remove any dirt from the mushrooms with either a brush or a damp piece of kitchen paper (don’t wash them). Cut up some of the larger mushrooms so you have a mixture of large chunks and whole mushrooms. Preheat the oven to 200C/Gas Mark 6. Cut the bread into 2.4cm cubes. Toss with 2 tbsp of the olive oil, the garlic and some salt. Spread on a baking tray and toast in the oven for 15 minutes, or until brown. Pour 1 tbsp of olive oil into a heavy pan and heat well. Add some of the fresh mushrooms and leave for a couple of minutes, without stirring. Make sure the mushrooms are not touching each other. Turn them over when they have lightly browned and cook for another minute. Remove from the pan and continue adding more batches, adding more oil when needed. When all of the mushrooms have been browned, add a further tbsp of oil and throw in the onion, carrot and celery. Sauté on a medium heat for 5 minutes, without browning. Add the wine and let it bubble away for a minute. Lift the porcini out of the liquid and squeeze to get rid of the excess liquid. Add the soaking liquor to the pan, leaving behind any grit. Add 400ml of water, the thyme and some salt, then simmer gently for about 20 minutes, or until the liquid has reduced to about 200ml. Strain this stock and discard the vegetables; return the stock to the pan and set aside. To poach the eggs you need to fill a shallow saucepan with enough water for a whole egg to cook in. Add a splash of vinegar and bring to a fast boil. Carefully break an egg into a small cup and gently pour into the boiling water. Immediately take the pan off the heat and set it aside. After 6 minutes the egg should be poached perfectly. Lift it out of the pan and into a bowl of warm water. When all the eggs are done, dry them on kitchen paper. While you poach the final egg, heat up the stock and add all the mushrooms, the soured cream, most of the chopped herbs (reserving some for garnish) and seasoning to taste. 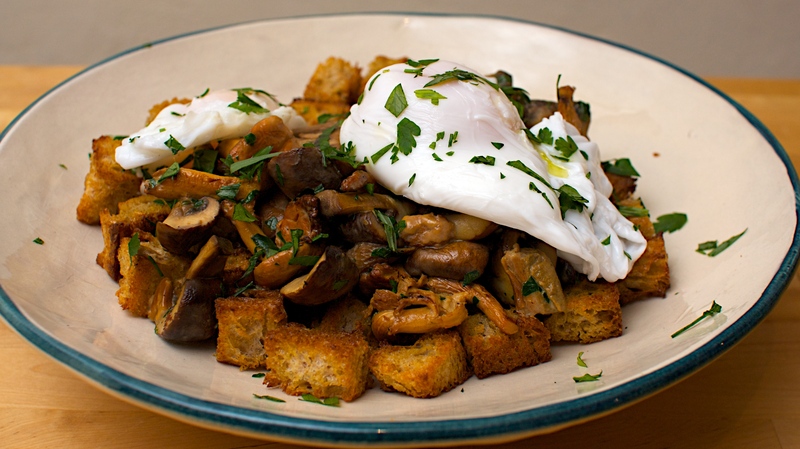 As soon as the mushrooms are hot, place some croutons on each dish and top with mushrooms. Add an egg, the remaining herbs and a drizzle of truffle oil and some black pepper. Wine Suggestion: If you want a wine with this go for a chilled young Beaujolais Villages which will have a nice fruitiness and a complementary earthiness to match the mushrooms. (Original recipe from Yotam Ottolenghi’s Plenty, Ebury Press, 2010). 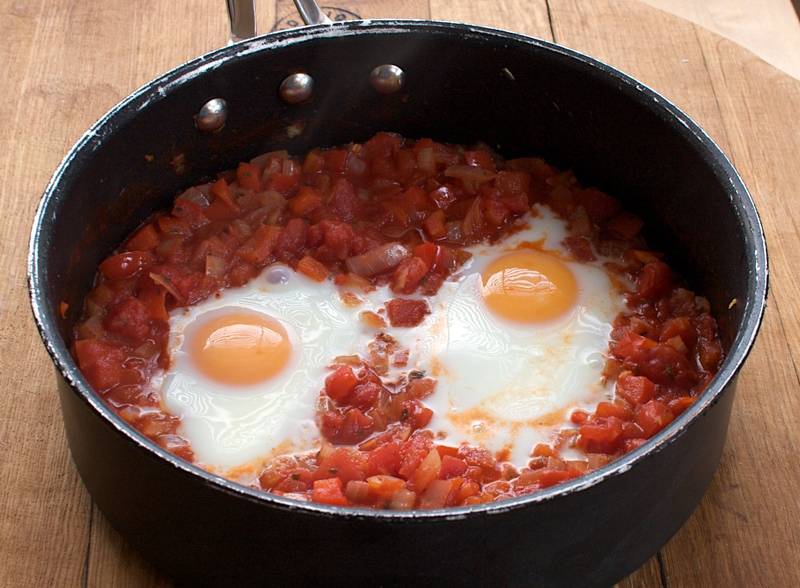 Eggs and hot salsa – we could eat this any time of day!